The fundamentals behind Membership Websites and Blogs. There are tons of websites and blogs featuring "membership" functionality, and unfortunately, only a few are successful. When it comes to memberships, there is an art and science behind them. To grow a membership-based website or blog, there are no secrets or mysteries. You either do it right, or you don't. When it comes to memberships, there is an art and science behind them. To grow a membership-based website or blog, there are no secrets or mysteries. You either do it right, or you don't. "A successful membership website or blog offers some kind of exclusive content or service that add value, answers questions, or provides a solution worthy of the membership fee." This article is based on sharing just a few of the foundational elements that should be considered before anyone ventures out and adds a membership functionality to their website or blog. It is our recommendation that bloggers or website owners adhered to and follow these basics concepts - because it does not make any sense in learning the hard way. Assuming that you are thinking about adding a “paid” membership feature to your blog or website, we recommend that you first learn from others, and then follow their lead. For example, you might want to launch the membership as a free membership package before you start asking for a reoccurring monthly fee. Many membership blogs and websites started out offering free memberships (or, ridiculously low fees for memberships). This is only one of many techniques that will help you build your dream membership site. Consistent Flow of High-Quality Content: If you’ve been toying around with the idea of earning a regular monthly income through a reoccurring membership fee, you'll need a consistent flow of high-quality content - period. It’s got to be worth the price of the membership or you won’t enjoy success. If your blog or website already has a consistent flow of content that answers your follower's questions or solves their problems, then you might be poised to add a membership feature. It always helps to have a huge following before launching a membership function to your blog or website. If you don’t have a huge following, you can still build a successful membership platform, but only if you are offering a unique source of content. You'll need to represent the needs of folks in unique ways, different from anyone else. Therefore, you must already have become, or are on your way to becoming an authority in your space or subject matter. Meaning, you really know your stuff, and people quickly recognize that what you offer is unique and valuable. If you have a small following, but good stuff to offer, you will be able to get people to pay for membership. Before you get started we recommend that you have a marketing plan and know the time requirements to do it right. If you are an authority or a subject matter expert, you'll still need a solid marketing plan. For example, bloggers have built their membership base by offering free stuff - offering value by giving away “teasers” of their stuff. Teasers are items that demonstrate a taste of the quality of their products or services. If prospective members like the free stuff they are more willing to sign up and pay for more. How do you plan on building your membership? Do you have a marketing plan? "We are assuming that you are a member of at least one membership website or blog. The question you need to answer for yourself is, “what specifically is it about the membership blogs I belong to that keep me paying a monthly fee? What is it that I like? What is that you don’t like?” What exactly makes it worth to me to keep paying a monthly fee to be a member?" Do you have the time? Most membership-based blogs provide a direct measurable value, consistently. That means a great deal of time must be invested into creating a steady flow valuable content. Whether that be in the form of educational pieces, webinars, infographics, podcasts, or video - there has to be some sort of insider information that only “members” get on a consistent basis. Perhaps your members pay for access to you or other's to get expert advice. Your members might value the ability to ask specific questions and receive personal support. Either way, do you have the time and bandwidth, or “team”, to provide the value of the membership fee? In following up the "time question", the next important item is, "do you have a content plan?" Do you know exactly what your audience wants and needs, and do you have a well-defined plan to provide quality content over time? Are you able to be nimble and add content that represents the latest trend, hot topic, or buzz? Are you organized, and do you have a strategy to produce what your members want and need? How are you planning to keep up with the demand for new, unique, and valuable content? These are important "keys" to building a successful membership-based blog or website. Below you will find more on building a membership blog. Let’s imagine you’ve published more than 100 articles on your website and you have 500 subscribers. Many of those articles drive substantial traffic to your site, and you’ve published 12 guest blog posts on other websites. Those guest posts also drive traffic and help you gain subscribers. About once a month, you get an invitation to be interviewed or sit on a panel. Due to the authority you’ve established, people in your industry look to you for advice, direction, and education. Launching a membership site might be an ideal way to monetize your authority. 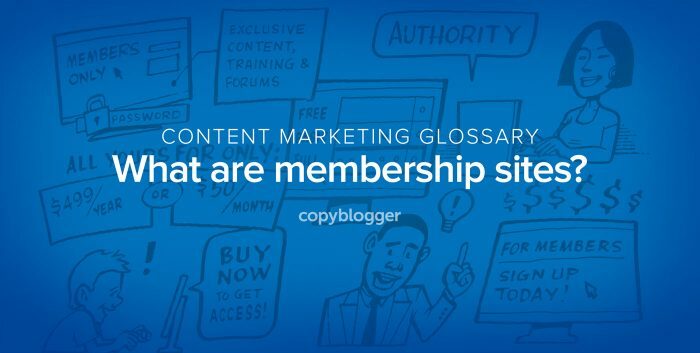 But what exactly is a membership site?